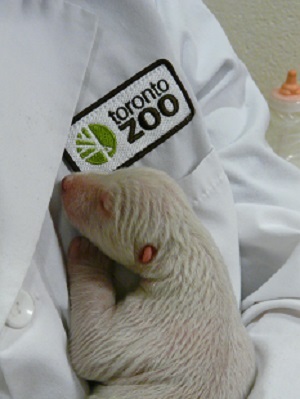 November 20, 2015, Toronto, Canada: Toronto Zoo announced today that Aurora, one of their two female polar bears, gave birth to two cubs on the evening of Wednesday, November 11, 2015. Sadly, one of the two cubs did not survive the first 24 hours and so staff intervened and moved the remaining cub to the Zoo's intensive care unit (ICU) in the Wildlife Health Centre (WHC). "Aurora demonstrated good maternal instincts and her cubs did attempt to nurse, but it appears she was not producing any milk to feed her newborns,” said Eric Cole, Manager, Wildlife Care. Veterinarians and staff from the Zoo’s Wildlife Health Branch anesthetized Aurora which enabled them to examine her and retrieve the surviving cub. At this time, the cub was moved to the ICU in the Wildlife Health Centre (WHC) WHC to give it the best chance of survival. While in the WHC, staff will be monitoring it very closely and providing supportive medical care as necessary, including intravenous fluids. It will also involve feeding a special milk formula which has been perfected over time by the Toronto Zoo’s staff given their past experiences hand raising polar bear cubs. "This is an extremely critical time for this tiny cub and Zoo staff are providing 24/7 care," said Dr. Chris Dutton, Toronto Zoo’s Head of Veterinary Services. "In the cub’s first week, it faced a few significant challenges that required medical interventions but so far it appears to have responded very well to the treatments we provided,” he added. Toronto Zoo continues to be involved in a collaborative research project involving multiple accredited zoos to understand polar bear reproductive biology. Polar bears typically give birth at the end of November or in December. Media Information: At this time, Toronto Zoo professional staff is focused on the health and survival of the remaining cub and the Zoo will share updates as they become available. Please note, the polar bear cub is not visible to the public. Please CLICK HERE for more information on the Toronto Zoo's involvement in polar bear conservation. Toronto Zoo is accredited by CAZA (Canada's Accredited Zoos and Aquariums). Look for this logo whenever you visit a Canadian zoo as your assurance that you are supporting a facility dedicated to providing excellent care for animals, a great experience for you, and a better future for all living things. For more information, visit caza.ca. To unsubscribe, please send your request to ldean@torontozoo.ca.